Remember me pleading with you to make it a December to remember? Of course you do. Well the best thing to do is to lead with example, which is exactly what I am doing. My goal for December was to fully enjoy the Christmas magic. By which I mean to attend all the Christmas markets I possibly can. Well I am totally keeping to my wish because I have attended five in just ONE DAY. I kid you not! I had been wanting to go to this festive city since last December so I made a point out of not missing out this year. The city being Cologne. It has been years since I went and numerous people were telling me how great it is so after waiting for 12(!) months I have finally been. Can you feel my excitement? After parking my car in the biggest smallest parking spot I could find, it was finally time to go and be festive. 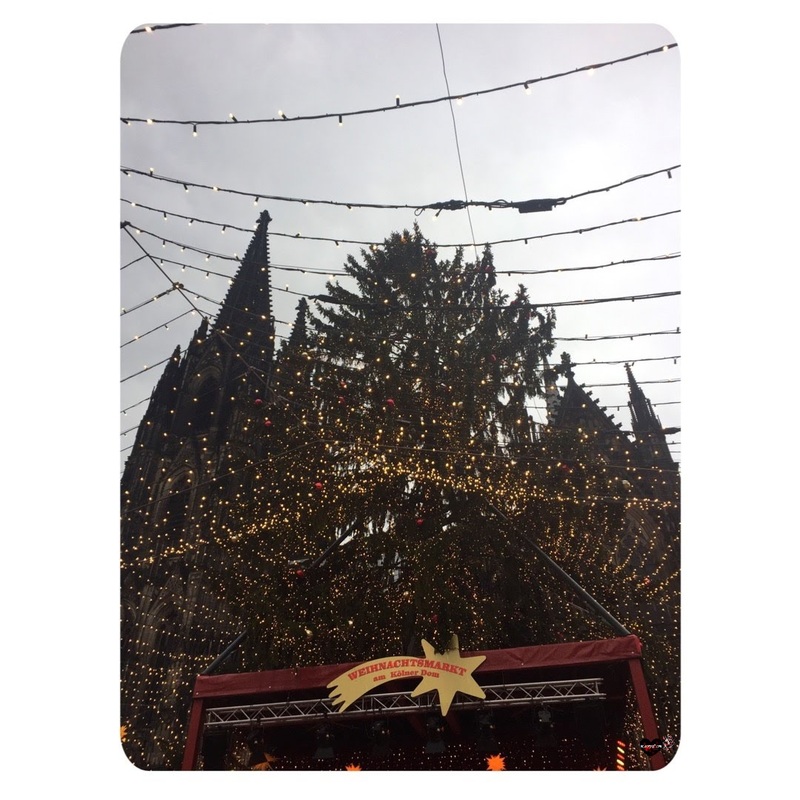 As soon as you’re in the center of Cologne you’ll be greeted by a rather big Christmas tree which really got me in the spirit. 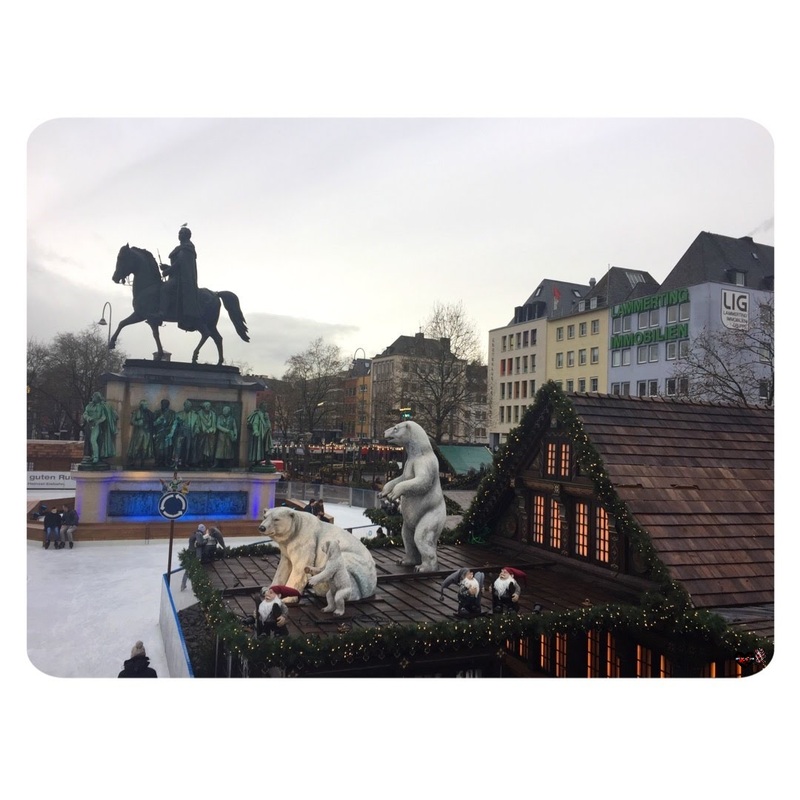 When I reached the first Christmas market the first thing I saw was their ice skating rink which had a rather funny aspect to it. Instead of people just randomly skating figures (if they can) there was a man dressed up and policing the people. He even had a whistle and a notebook! Someone actually got called back and got a ticket. The playfulness of it all was very amusing! As I slowly navigated my way through the first Christmas market I ended up at the Cologne Cathedral which is a beautiful sight on its own. Now that they put a giant Christmas tree and lines of lights in front of it, it only got better. Apart from the market there was also some live entertainment singing all the Christmas hits. If you weren’t already feeling enchanted after strolling over this market you definitely will. I wandered around humming the songs and enjoying all the beautiful sights the market had to offer. The temptation to get new Christmas decorations was big as I saw some very beautiful items there. To get to my next Christmas market I had to walk through the shopping street of Cologne. I thought while I was there I might as well have a peek in a few shops. My shopping spree was well timed, because as soon as I set foot in a shop the rain started pouring down! I got so lucky. Even luckier when 10 minutes or so later it stopped raining and it was dry for the rest of the day. I also discovered that Cologne is not only good for Christmas markets but also for shoppers. All my favorite abroad shops were lined up for me to visit. Yes, I bought some Christmas gifts for myself🙈. Treat yourself & make it a December to remember! After showing myself a lot of love in the shops the love continued when wandering towards the Markt Der Engel (= Market of Angels). 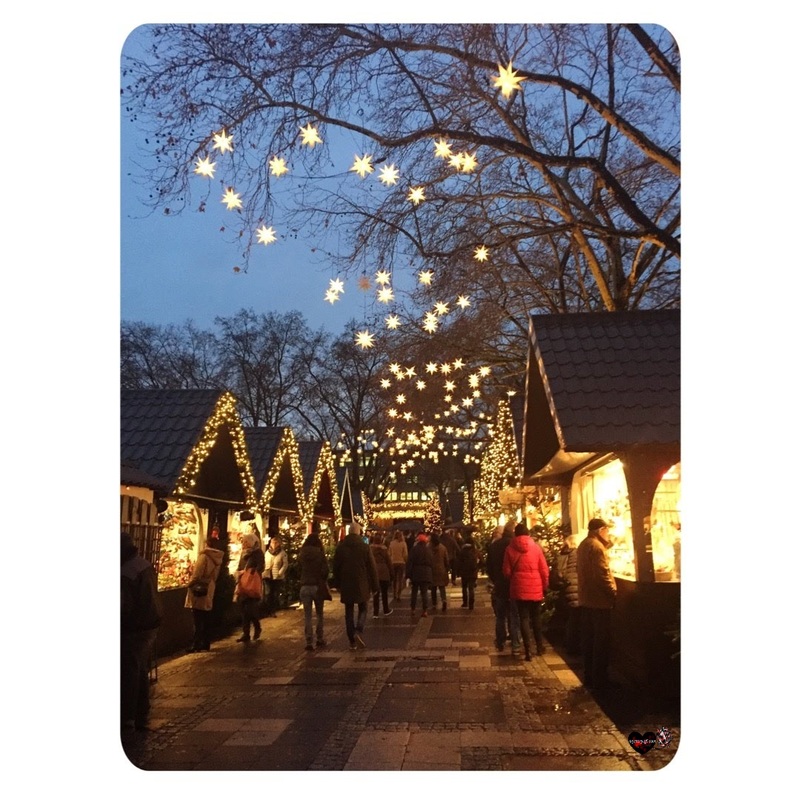 There is not a Christmas market that is more romantic than that one. Seriously. The lights in the trees make it all so romantic. It’s incredible. Also it’s not a very big market which to me adds to the magic of the market. It gives it a very cosy feel. If that is not enough you can get your picture taken with angels that stroll over the market. The costumes are beautiful, especially with that very romantic lighting. Perhaps it’s such a charming market because it is the oldest one in Cologne. There was one Christmas market booth that I probably will never forget. First let me say it was a booth were children could do all sort of activities. I didn’t go in because, well.. I’m 23. So there is a fair chance that I’m over the age limit. Either way I enjoy the outside of the booth which had the cutest little train on top of it. I sincerely wonder whether it is functional. It did look like it. I unfortunately didn’t stick around long enough to find out because I was too excited to go to the last Christmas market. The one that I had been told about numerous times. Christmas Avenue is a Christmas market like any other. 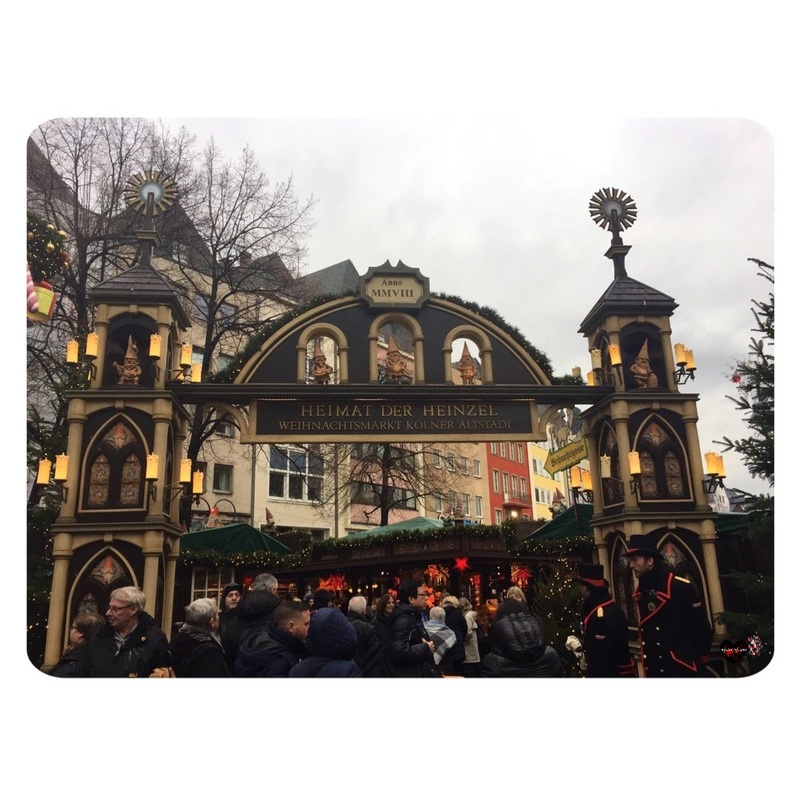 You’ll find your gluhwein, hot chocolates and sweets to enjoy yourself. However the booths are decorated a bit different. They’re PINK! Pink and beautiful! It is Colognes gay and lesbian Christmas market. I don’t really see why they need a separate Christmas market but that’s a different issue. The market gives you a completely different feeling, well it gave me a completely different feeling. The other four were more enchanting and romantic. Christmas Avenue got me in a holiday party mood. I fully understand why I was told that I would like it very much. In case you were wondering there is plenty of food to be found on the markets as well. At Markt der Engel I saw a waffle in the shape of the Cologne Cathedral. On basically all markets you can get a steak with some fries, not necessarily at the same booth but usually not far from each other. And for those who consider steak and fries too much of a lightweight meal. You can have yourself a half a meter meat filled skewer. The classic German bratwurst is also easily found. I’m super happy to have made a point out of not missing out on the Cologne christmas market. It was definitely worth the wait.